CheapSmells is heading for a saving of £20,000 this year, on materials alone, thanks to the new label print system. Guernsey-based CheapSmells, one of the first companies to try out the innovative Duotherm double-sided label print system from Forms Plus, is predicting an annual saving of £20,000 on printing alone, based on its performance over the last few months. As its name suggests, CheapSmells is a supplier of perfume and other fragrant products at discount prices. Selling online from www.cheapsmells.com, its range includes perfumes, aftershaves, skin and hair care products, and cosmetics. Demand for these branded items, which are available at a fraction of the usual RRP, is huge. To keep the costs low, and to maintain customer satisfaction, it is essential that orders should be picked, packed, labelled and dispatched as quickly and efficiently as possible. In addition to saving on paper and avoiding the cost of other consumables such as toners and plastic ‘document enclosed’ wallets, the Duotherm process substantially reduces the amount of staff time involved in labelling. “Our aim has been to increase cost efficiency, in terms of both materials and labour,” says CheapSmells Director Janice Mancini. Duotherm labels can be produced in a variety of formats, styles and sizes. In every case, application of these labels is virtually instantaneous compared to the lengthy process of folding documents and inserting them into a document wallet. In this version the adhesive label is applied to the outside while its printed release liner is placed inside the parcel. In one version, the label has adhesive edges and a central section which can be simply peeled back to reveal the information printed on its reverse. In another, the reverse-side printed information is on the release liner which would normally be thrown away. 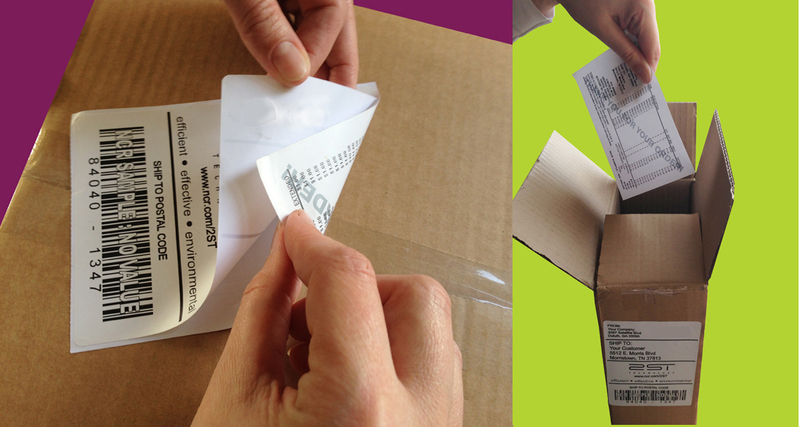 The adhesive label is peeled and applied to the outside, while its release liner is placed inside the parcel. Forms Plus Sales Director Gordon Leer says: “We’re delighted that the system is working out so well for CheapSmells. The reduction in printing costs clearly justifies the switch to Duotherm on its own, but the amount of money saved by reducing labour will also be very significant. For further details of products and services from label and form specialist Forms Plus call 01326 564331, email mail@formsplus.co.uk or visit www.formsplus.co.uk. Tags: CheapSmells, double-sided, Duotherm, Forms Plus, label print, labels, Mark Nicholson Copywriting, perfume, thermal technology. Bookmark the permalink.